When Steven Carpenter was asked to help build out an animation program in the middle of the country at Drury University, the veteran digital artist couldn’t resist the opportunity. Having worked at a number of studios including Rhythm & Hues and Digital Domain over the course of two decades, Carpenter uprooted to Missouri with his eyes set squarely on developing a rigorous interdisciplinary program fit for twenty-first century animators. Students in Drury University’s Animation major gain from Carpenter’s insight as well as his enthusiasm for the craft. They also learn the many ways in which to animate, as well as the diverse career opportunities that come with their newly developed skillsets. We recently caught up with Carpenter to learn the ins and outs of Drury’s animation offerings. We hope you enjoy our latest Spotlight Q&A! ACR: Steven, you joined Drury University’s faculty roster a few years ago to build an animation program. Can you give us the backstory on the program and what excites you most about teaching at Drury? 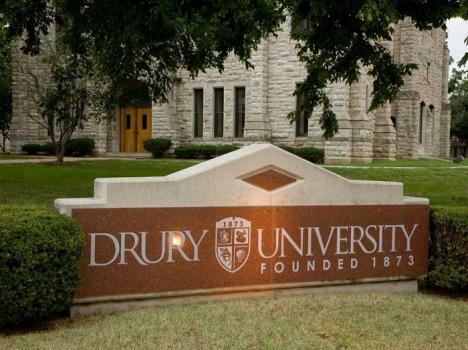 Steven Carpenter: Drury University is a liberal arts college and is always looking for complementary programs. It already had a strong Computer Science program which was expanding into Gaming, so adding animation was a natural progression. Our goal is to match the local, regional and national recognition that our other programs here at Drury have already attained. I’m most excited about collaborative projects that our animation students have with other departments. Just last semester, we had three students produce an animation that was incorporated into a Theater Department production. That kind of collaboration will become the norm here. ACR: On that note, there’s a strong interdisciplinary element to Drury’s Animation major, isn’t there? SC: Yes, definitely. Back to the university being a liberal arts college, interdisciplinary work is part of every program at Drury. In the Animation program, majors take foundational art courses such as Drawing I and Foundations in Studio Arts, a Creative Writing course and a Multimedia Communications course. They then choose between additional writing courses, architecture courses, theater courses, music composition courses or some combination of several of these. If animation students are really brave, they can even try some programming courses from our Gaming program. Many students elect to earn minors in these other areas or dual major. ACR: Students take quite a few foundational courses in Animation to start off their education. Tell us a little about these, Steve. SC: All Animation majors start with the same animation courses during their first 3 semesters before branching out into courses that best match the career goals. The main goal is to expose them to as much of the animation process as possible so that they can discover where their talents and passions are in order to use the remainder of their academic career to build those specific areas. During the first semester, animation students take History of Animation in which they watch and critique over a dozen films. They learn animation and filmmaking terminology, what makes a good animation/story, and how to clearly voice their opinions. They also take the Principles of Animation studio class in which they start animating on day one; over the course of the semester, students learn how to apply animation principles and transform a simple ball into a character. During their second semester, they animate in both Animation I and Computer Animation I studio courses. We cover pre-production processes in the Animation classes like storyboarding and character design. In the Computer Animation class, they do post-production processes including compositing and editing. In the third semester, they take Animation II and produce hand drawn animation, digital “puppet” animation, paper cut out animation and stop-motion animation. They also take Computer Animation II in this semester and learn how to model, texture, rig, and light. ACR: Undergrads culminate their studies with a capstone project. Uniquely, some students work on multiple projects. How do they decide which project(s) to complete? SC: Capstone projects are team projects and students get involved with however many fit into their career goals; if a student wants to focus on storyboarding, they may end up working on several projects since most of their work is done at the front end of a production. Once all the storyboards are finished, then they may settle into animating on just one of the projects. The same would be true of a student who wants to focus on compositing. Conversely, a student who wants to focus on character animation would probably work on only one project and maybe even only on one character if it has lots of scenes and animation. Most of these projects are student-driven, meaning that students will write the story in Creative Writing, storyboard it in Advanced Storyboarding, design and model characters while in Advanced Modeling, and then move into full fledged production during their senior year. We are currently working on a secret project that everybody is really excited about. I can’t share much more about it, but look for social media pages in the very near future about this production. ACR: Are there lessons you learned in your years working in industry that you try to inculcate in your students? If so, how do you do it? SC: Yes… that this would be a great industry if it weren’t for clients! Joking aside, how to work with clients and how to work in a team production environment are essential. We focus on two major facets with our students: first, we help them find and develop their talents, and second we teach them how to be a professional. We accomplish the first by introducing students to the many different areas and techniques of animation. In their first year, all students produce a lot of hand drawn animations as they learn the 12 principles, and the basics of compositing and sound design, modelling, texturing, and animating in a 3D package. They do a stop motion animation and a 2D puppet animation. So we throw a lot at them- most of which they have never done before. This way, they can figure out where it is they want to go. We accomplish the second facet by constantly having students work on group projects. If you don’t finish a painting in painting class, or don’t finish a paper in an English class, you only affect your grade. But when you don’t get your work done on a group project, you’re affecting others’ grade as well, so it’s a totally different mind set. ACR: Do Animation majors participate in internships, Steve? SC: Although internships are not required, Drury encourages them and our students go all over to participate in them. Just last summer, we had a student intern at Marvel Entertainment. Beyond being a great work experience, internships are great networking opportunities for students. In our business, artists are constantly moving from studio to studio and working on various projects, so the more people who know you, your work and your work ethic, the better. ACR: That’s a good segue to my next question. Drury’s Animation program puts the various career options for animators front and center. How do you help students see the many opportunities available to them? SC: Currently, the “golden ticket” career is working for Pixar so many students have that as their dream job. I let them know that they need to earn it, and earning it may take them in a number of directions. Our world has become so visual- there are screens everywhere and animations everywhere, so there are lots of different opportunities for animation artists to make a name for themselves. These opportunities range from motion graphics - which is a growing field in itself- to medical training animations using AR and/or VR for medical students. ACR: Turning the tables back to you, did you have any favorite projects that you worked on while in industry? SC: Working at Will Vinton’s Studio on the M&M commercials was huge and I had a great time in Portland. My favorite project, as crazy as this sounds to me, was “Starship Troopers: Roughnecks.” I worked on it when I was at Flat Earth Productions. The project was insane, the schedule was insane, the amount of models was insane, the amount of animation was insane and the amount of FX was insane. Lots of long days during that production! The owners and crew at Flat Earth were great, and I still keep in contact with several people. ACR: We hear that Drury has a new animation lab on campus. Tell us a little about it and how students can leverage it throughout their education. SC: The lab is a large classroom with 18 total student workstations, two per table. Each workstation has a PC loaded with a ton of RAM and a 22HD Cintiq. The students love them! The instructor station also has a 22HD Cintiq and projects onto a 90 inch flat screen TV. Beyond all the Adobe Cloud software and the Autodesk Creative software, the student stations have all the other software that they use in other courses, so they really only need to leave the lab to attend classes, eat and sleep. And they will tell you that they often end up doing the last two in the lab, as well! ACR: That’s an exciting addition, to be sure. Outside of the classrooms, students also congregate in the animation club, don’t they? SC: They do. And since the club is an officially recognized student organization, we get an annual budget from SGA that enables us to take trips. Last year, we went to a film festival in Kansas City and we also invited guest speakers to campus. This is all student-driven, so they are they ones who decide where to go and who to bring in. ACR: Students can gain an excellent animation education smack in the middle of the country at Drury… you don’t need to go to the big coastal hubs anymore, do you? SC: Animation is happening everywhere; it isn’t just TV and films anymore. So while LA and NY continue to be centers for producing films and shows, animation is produced all over the globe. In fact, I’m currently working with the animation program at the Universite de Toulon in France, putting together a collaborative project for our students. That should be a very interesting experience for all involved. We are building something special here at Drury. We aren’t training students for the future; we are training them to CREATE the future. Just wait until you see what they do next!